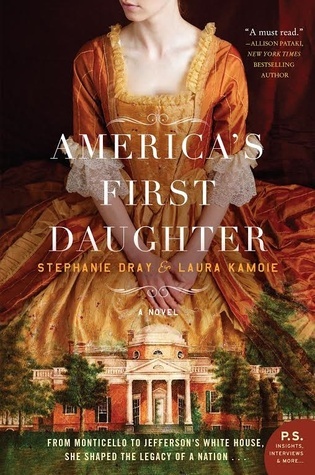 It is in Paris, at the glittering court and among the first tumultuous days of the revolution, that fifteen-year-old Patsy learns about her father's troubling liaison with Sally Hemings, a slave girl her own age. Meanwhile, Patsy has fallen in love--with her father's protégé William Short, a staunch abolitionist, and ambitious diplomat. Torn between love, principles, and the bonds of family, Patsy questions whether she can choose a life as William's wife and still be a devoted daughter. I rarely read nonfiction. I believe one reads it to learn about the subject of the book, especially to be able to recall that information at a later date. I have no ability to remember details and facts, so I let myself enjoy reading fiction and leave it at that. This book, though—reading a fictional account of the life of America's First Daughter, Martha "Patsy" (Jefferson) Randolph—was the ultimate compromise between the two genres. It took me three days to read. It's a substantial story; and yet, her life was necessarily condensed to 624 pages for the purposes of this novel. I put my Kindle down frequently and not because I didn't find the story compelling. I did that because I wanted to read the novel and reference sources concurrently. My daughter is a Virginian, and I lived there for many years. I visited Monticello and Poplar Forest. Nothing I read (or saw) before this novel had me so interested in the lives of the residents of those two historical places. My main interest in the family previously (and mistakenly) lay with the facilities, rather than their inhabitants. I felt extremely fortunate to have walked the grounds where the Jeffersons made history, and I feel grateful to Stephanie Dray and Laura Kamoie for giving me a personal insight into who the Jeffersons were known to be and who they may have been beyond the letters. I never would have a say, because in the world outside the convent, men did as they pleased and women were left to simply accept the consequences. After the House of Representatives voted thirty-five times in a deadlock, on the thirty-sixth ballot my father was elected, peacefully and democratically, to the presidency of the United States. 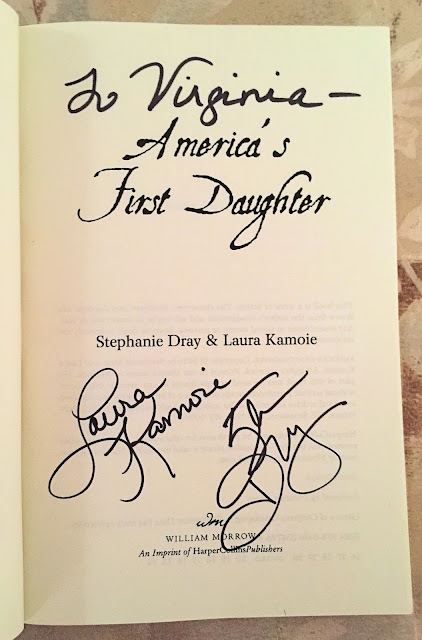 This book and I have quite the history...I purchased a paperback copy from Amazon in February 2016 to be signed by Laura Kamoie at an event in Virginia that April. I wasn't able to attend, so it was not signed. In May I mailed it to California ahead of my move. In June I purchased the Kindle edition but did not read it until January 2017. After reading and reviewing it, I wrote to Laura Kamoie asking if she would sign my copy if I mailed it to her. Not only did she say yes, but she also said she would have Stephanie Dray sign it as well. So, in February I sent my copy with a self-addressed stamped envelope. When I hadn't received it after two months I wrote to Laura; she replied immediately apologizing about the delay. When she wasn't able to find my exact copy she and Stephanie signed another copy and mailed it right away. I feel extremely fortunate to have this signed copy and will treasure it always.